Having a dog door available for your pups can make life much easier for you. The dog can go in and out when he or she pleases. Installing one can be difficult if you're not handy but thankfully there are pre-installed options you can buy. Having a screen door with a pet door installed allows you to let the breeze in during lovely weather. The screen acts as a barrier for unwanted pests like mosquitos and flies. Available from Lowes, this screen door gets an average rating of 4.5 out of 5 stars from happy customers. The door has a 10" x 17" pet door for dogs up to 100 pounds. The window screen surrounding the pet door is tear- and puncture-resistant, and the door has an attractive brown aluminum frame. It also is available with a white frame and in 32" and 36" door sizes. It sells for about $218. This storm door is not a full screen door as it is sectioned off between solid storm door sections made of glass. You can choose to have the screen section at the top or bottom of the door. The pet door is 10" x 17" and is good for dogs up to 100 pounds. The company claims their WearTuff Screen is three times stronger than typical screens. The frame comes in white and is available in 32" and 36" sizes. It sells for a little under $400. 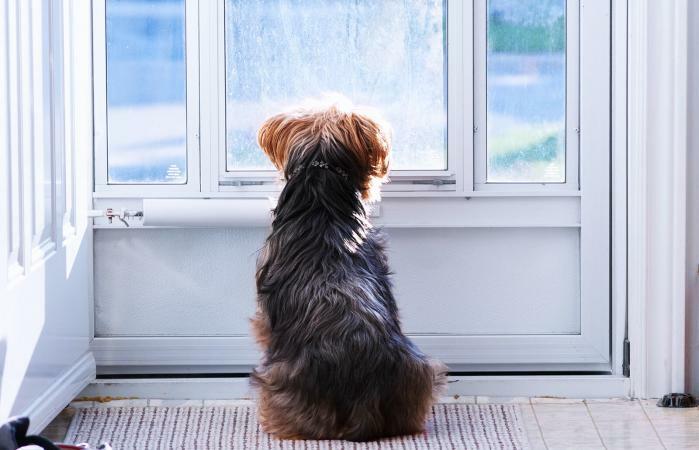 Another option is a storm door with a dog door pre-installed for climates where having a full screen door isn't a viable option. This storm door is available in white and almond and in 32" and 36" common door sizing. The dog door is 14" x 23" and is perfect for dogs up to 200 pounds. The door is made for cold climates with heavy duty weather stripping and a magnetic bottom sweep for the pet door flap to keep out cold air. The bottom panel above the pet door can also be used as a screen instead of glass to allow for ventilation. The door sells for about $400. This storm door features two top sections, one of which can be converted to a screen for days you want to let the breeze in. The door comes in white and in sizes 32", 34" and 36". The dog door is 10-1/2 x 15-3/4 and works for large dogs up to 90 pounds. There's also a choice of nickel or brass levers and the choice of an upgrade to add a deadbolt lock. It sells for about $277. Another option for homeowners with a sliding screen door is to use an insert. These slide into place and have the dog door installed underneath. The benefit of these doors is they require no installation or cutting and can be removed easily. This sliding pet door comes in sizes for small, medium, large and large/tall dogs. The small fits dogs up to 15 pounds, the medium up to 40 pounds, the large up to 100 pounds, and the large/tall up to 130 pounds. The door can be used with any sliding glass or screen door that is 76-13/16 to 81 inches tall. Pricing begins at about $130 up to about $210. This sliding pet door comes in white and silver and in sizes small, medium and large. The small is for dogs up to 12 pounds, the medium for dogs 13 to 35 pounds and the large is for dogs 36 to 90 pounds. The door height works for patio doors between 77-5/8 and 80-3/4 inches high. It sells for between $118 to $160. If you decide you'd rather make your pet door in a screen door on your own, it's not that hard to do! Take some 1"x2" boards and cut them to create a frame. The size should be based on your dog's height and width. You will cut four boards, which consists of a vertical and horizontal board for each side. Cut a half-flap into the corner of the boards where they will connect on the screen. Glue the pieces together for each side and give them ample time to dry. Clamp the boards in place to the screen door and using a drill, add a hole where the end of the boards overlaps the frame at the side and bottom of the door. Use a bolt through the door and frame to keep the frame in place. Place a clear vinyl sheet over the frame with each side at least one inch longer than the frame. Use a utility knife to cut the vinyl to fit exactly the width and one inch more than the height of the frame. Glue the vinyl to the frame through the screen and allow to dry. Cut out the dog door flaps on the side and bottom and put the screen door into place. If you already have a screen door and want to add a pet door without getting a whole new door, installation isn't that difficult. The dog door you purchase will provide a frame that you will add into the bottom corner of your existing screen door. Using screws and a drill, you will set the frame into place by securing it to the bottom and side of the door frame. Once the frame is in place, go inside the door and cut away the screen from inside the door. Your kit should provide you with guidelines for where to cut. Once the screen is cut out, the pet door frame with the vinyl flap will cover the cut-out area. The frayed ends of the cut screen will be placed into the inner frame and secured so your dog will not rub against them when coming in and out. Any dog owner with a pet door can tell you how convenient it is. Adding one to an existing screen door does not require a lot of DIY know-how or serious tools, but if you prefer to go the easy route, there are several options for purchase for pre-installed pet doors.